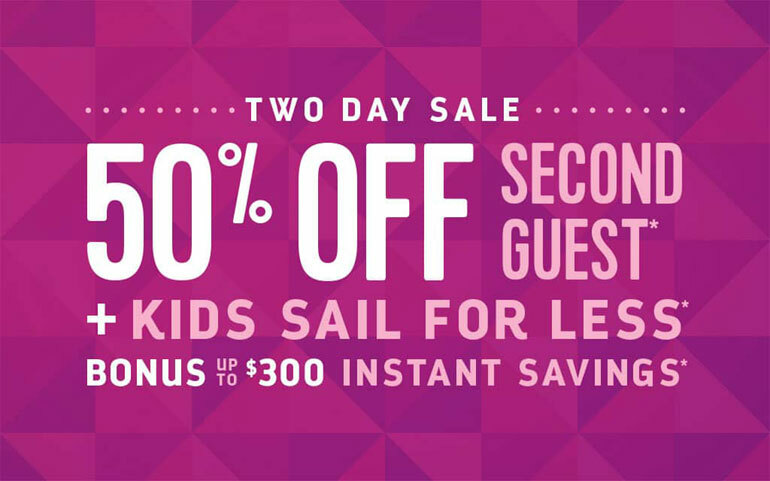 Royal Caribbean has launched its new sale where cruisers have the chance to get up to $300 instant savings. We’re always ready for a cheaper cruise and ways to save money and Royal Caribbean might be the cruise line to go for thanks to its new two-day sale. The cruise line is running a new sale where cruisers can get up to $300 instant saving on sailings departing on or after Agust 10, 2017. But that’s not it, Royal Caribbean has added some extra benefits on the sale including 50% off the second guest and 25% off third & fourth guest. The sale includes all departures except those in China so plenty to choose from. You’ll have to be fast because the time I’m writing this there is only just over 36 hours remaining. The Two-day sale will end on July 11 just at the stroke of midnight. As always when we let you know about any cruise deals and sales you should read the terms and conditions before booking your cruise vacation. Make sure you also take a look at the top 10 Royal Caribbean cruise deals for even more savings.